Jo’s concerned face came into view. As did Pepe’s. A terrifying thought flashed through Adhat’s mind as he scrambled to get up. Pepe shot him a quizzical look then glared at him with a disgusted look on his face. Adhat breathed a sigh of relief. “Including hydrating yourself regularly. Good grief Adhi, you’re not a camel you know?” Jo pointed out. “Although he sure looks like one” whispered Pepe. Adhat eyeballed him with a few choice daggers. Instead of counting how long more to your next drink, try making it show how long it was since your last drink! 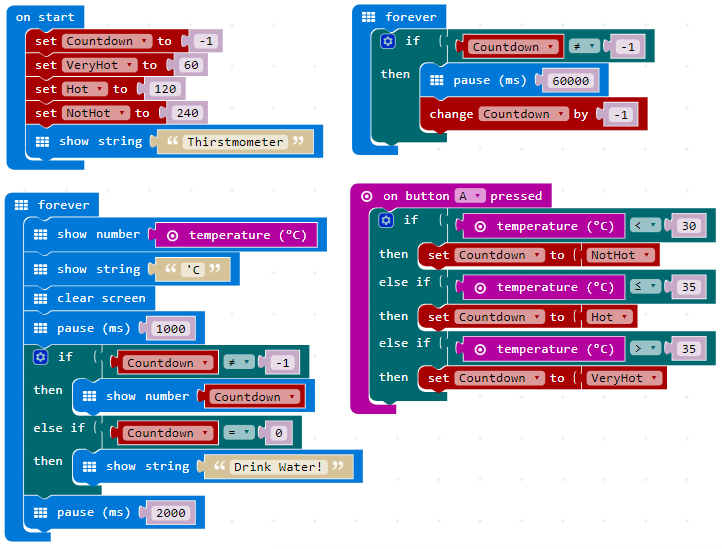 Click the button below to download the block editor code for the thirstometer. The hex file is contained in a zip folder.